Fritters of bananas is not so exotic in taste as it seems. Easy to prepare and extremely fast pancakes is sure to please children and adults alike would love to try this dish. - bananas (2 PCs); - flour (0.5 cups); - eggs; - sugar (1 tablespoon); - salt; - olive oil (1-2 tablespoons). In a large bowl with a fork mash the two bananas. You can use a blender. Then mix the egg, salt and sugar. Add in the flour. The batter should be not too liquid and not too thick, not necessary to achieve complete homogeneity. Warm the pan. Fry the banana pancakes recommended olive oil, but ordinary will do. Pour the oil into a pan. When it get warm, a tablespoon put the dough on the pan and easily fry the pancakes on both sides on medium heat. The Browns will have to turn in a minute, stay by the stove! 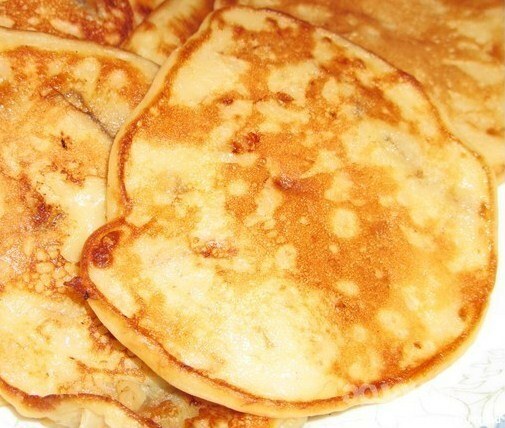 Pancakes of banana prepared very quickly. Serve the banana pancakes are good with jam, jam or condensed milk. And another is to try to combine them with ice cream - very tasty! From this recipe you can exclude the sugar that will delight all who are on a diet. Bananas are so sweet, but if you're going to eat pancakes with jam or chocolate paste, sugar to add is not worth it, the taste was not too cloying. This recipe will help you to find a use for overripe bananas that need to be urgently eaten. Them mash easier and taste of pancakes will only improve.